Simple, tasty, Japanese style. 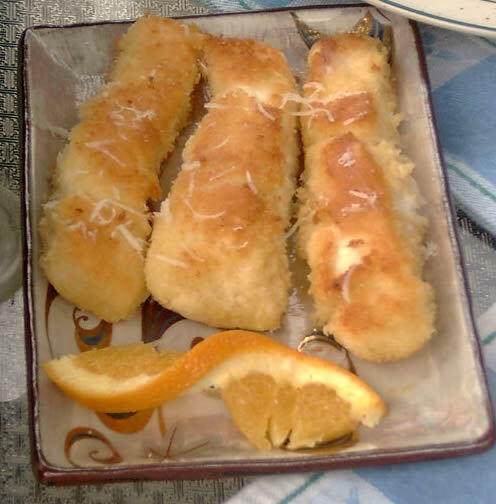 Healthier than Tonkatsu, with the same "oishii" taste! Itadakimasu!! Skinless (you see the pattern?) Alaskan Halibut, Panko Japanese breadcrumbs, seasoned flour, egg, malt vineagar, oil. This recipe is now a family treasure. 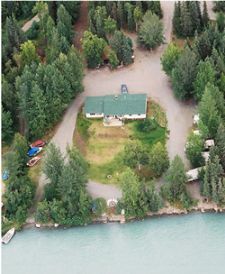 We love to prepare it for almost every Fish Fry or Salmon Bake in the summer at Kenai Riverfront. We created it based on our exposure to cuisine while living in Japan and with some help of our old favorite fish & chip Japanese friend Emi in Whittier, Alaska. It's a bit messy to prep, but you'll get a system down in no time. Take 3 containers and put the seasoned flour (or Minnesota Shore Lunch mix) in one, beaten egg in another, and panko in the third. Roll the halibut pieces in each container, then fry in oil till golden brown. Not too hard, eh? You can email us for our homemade tartar sauce recipe if you like too! I still prefer Japanese Tonkatsu Sauce myself, Bull Dog brand, available at most Asian grocery stores. Kenai Riverfront's "Alaska Halibut Katsu", served on Kutaniyaki!